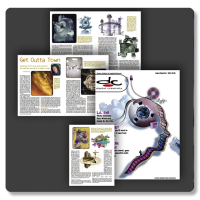 Cover and 5-page article on Russ Widstrand's photographic collages. Perhaps best known as one of the pioneering photographers to embrace the convergence of computers and photography, Widstrand has achieved international recognition as both an artist and visionary. Through his alternative photographic techniques and conceptual collaboration with clients, Widstrand carved a new niche. The result was an explosive body of work in digital collage that pushed static boundaries of the obvious and gave his clients a marketing edge that distinguished them from the competition. 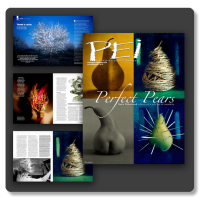 Cover and 6-page article on Russ Widstrand's Pear Series. In early 2000, Widstrand's photography took a dramatic turn, leaving the cerebral expression of the computer for a more emotional and introspective direction. The result of this new direction is the "Pear Series", conceptually gestated over long periods, and shot quickly on Polaroid film, the pears gave a new voice to Widstrand's work. 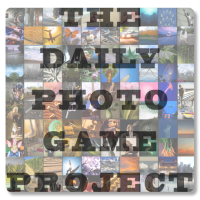 The Daily Photo Game is a group of 10 professional photographers challenging themselves to do what they do best: illustrate ideas and communicate concepts through photography. The Game is a visual conversation and as with all conversations - some are serious, some mysterious and others are humorous. See Russ Widstrand's contributions here. How it works - Every 10 days in repeating order, a given photographer's "game day" will arrive. On that day, the photographer will create and post a new image, a visual response to the previous photographer's submission. 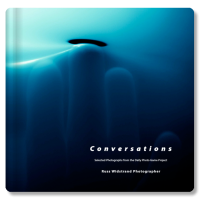 Russ Widstrand's 64 page 12"x12" coffee table book based on his photographic and conceptual conversations with players from the 2013 Daily Photo Game (DPG) project.